We are continuing to monitor an area of showers and thunderstorms in the central Caribbean associated with a strong tropical wave. The system has undergone some strengthening over the last 24 hours and additional development is certainly possible given the conducive environment. 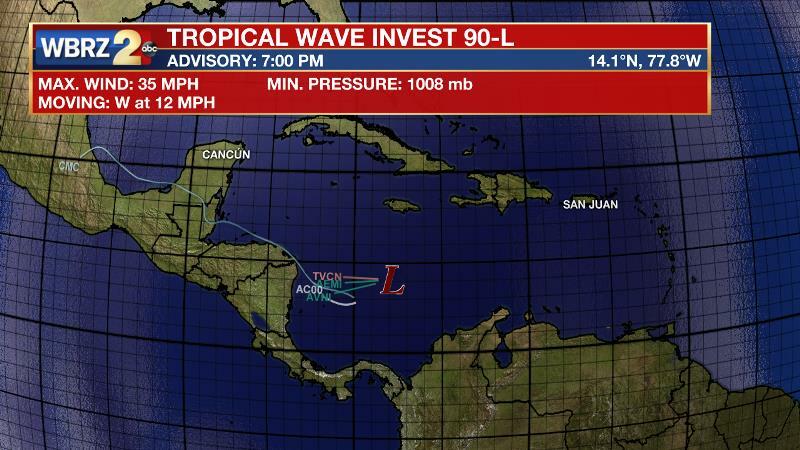 Currently the tropical wave known as INVEST 90L is moving west-northwest at 10-15 mph and it is very likely that a tropical depression or tropical storm could form over the northwestern Caribbean sea before it reaches the Yucatan Peninsula late Monday or Tuesday. 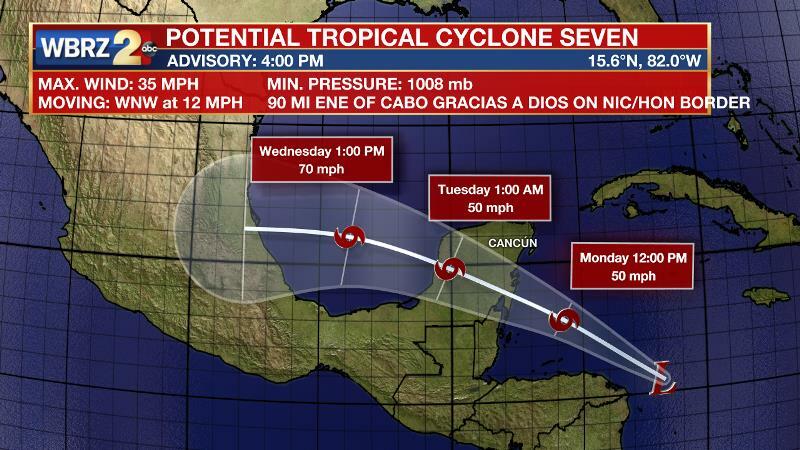 The current track of this system suggests that it will potentially move over the Bay of Campeche by midweek and continue on a west-northwest trajectory which would not affect the U.S. mainland. There is a slight possibility that the system could continue on a direct westward path and move inland over Central America and southeastern Mexico where further development would not likely occur. 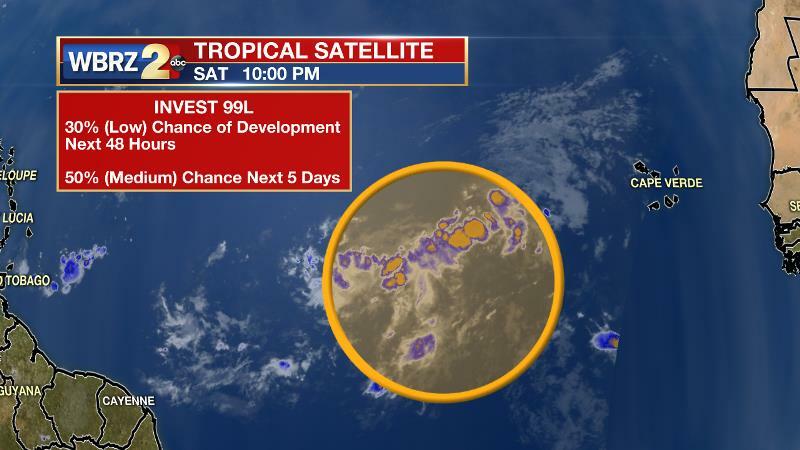 The Air Force 53rd weather reconnaissance squadron known as the "Hurricane Hunters" are scheduled to investigate this area on Sunday afternoon. The National Hurricane Center has assigned a 50% chance (medium) of formation through 48 hours and a 70% chance (high) through 5 days. Not much change has occurred with this elongated area of low pressure that is currently situated about 1000 miles west-southwest of the Cape Verde Islands. The system has become slightly better organized over the last 24 hours and some development is possible during the next 72 hours. The tropical wave will begin to encounter an area of less favorable conditions by mid week as it continues on a west-northwestward track around 15 mph across the Atlantic basin. 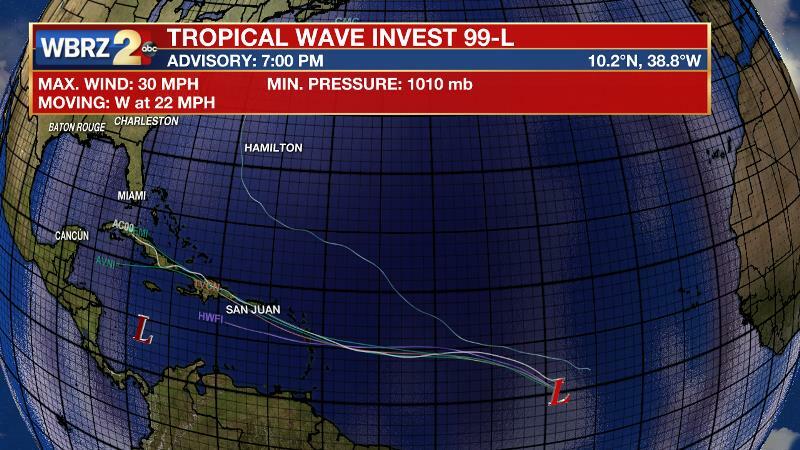 The National Hurricane Center has given a 30% chance (low) of formation through the next 48 hours and a 50% chance (medium) of formation through 5 days. Deep tropical moisture associated with strong southerly flow will lead to increased shower and thunderstorm activity for Sunday trough Tuesday as a lingering trough of low pressure continues to hang over southern Louisiana for the next few days. Expect isolated areas of thunderstorms to erupt around the noon hours, and it's entirely possible to see some earlier storms develop by mid morning. Some areas could potentially see rainfall rates from one to three inches depending upon where these isolated areas of convection fire up. Some areas have already picked up nearly four inches of rain on Saturday and this will lead to a saturated ground that could allow wind gusts to topple large trees. The main threat with these storms will be heavy rain, dangerous lightning and gusty winds. Stay tuned to WBRZ for the latest weather updates.